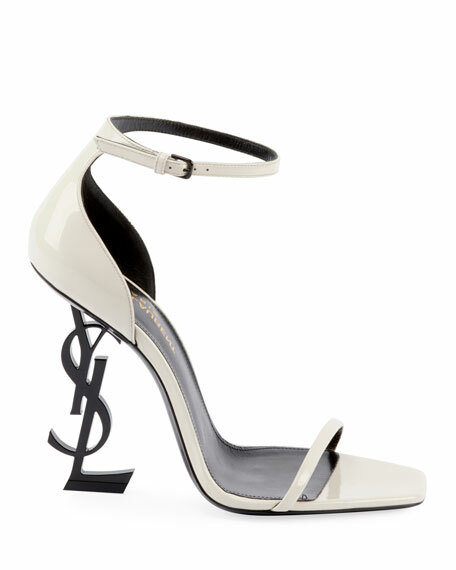 Saint Laurent shiny patent leather sandals. 4.3" blackened metal YSL heel. Sam Edelman patent faux-leather (polyurethane) sandals. 4" covered stiletto heel; 0.3" platform; 3.7" equiv. Strap bands open toe. d'Orsay silhouette. Sam Edelman patent faux-leather (polyurethane) sandals. 4" covered stiletto heel; 0.3" platform; 3.7" equiv. Strap bands open toe. d'Orsay silhouette. Adjustable ankle strap. Stud at backstay. Padded footbed. Smooth outsole. "Ariella" is imported.